To go along with my previous post about companies that own me, I found out that another company has seemed to take over my… bathroom. Yes, you heard me. Phillips currently controls a large part of my personal hygiene. 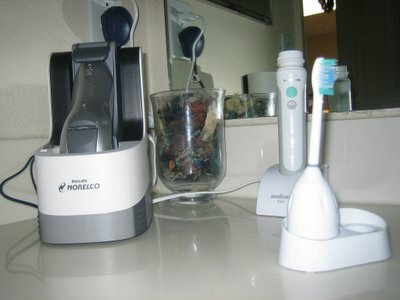 The Sonicare that I love so dearly is Phillips and that Norelco shaver… yea Phillips too. Here’s to you Phillips. Thanks for your dedication to improving my personal hygiene. In case you are interested, here is my current Phillips tag team setup. I got this new Norelco shaver that comes with some crazy washing system off of Amazon for $50 (looks like they already raised the price though…).